On 30th June 2014, BSi published a publicly available specification known as PAS 128. 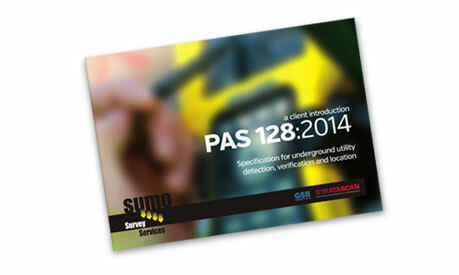 It's full title gives a clue as to what it is all about: PAS 128 Specification for underground utility detection verification and location. At the beginning of 2012 the stakeholders in the utility survey industry got together at BSi in London to discuss utility surveying in the UK and whether or not it needed regulating. Here it was agreed that whilst acknowledging the good work of The Survey Association in producing ‘The Essential Guide to Utility Survey’, there was indeed a need for an industry wide consensual document. In particular, specifying the minimum requirements needed in carrying out a utility survey. Part-funded by SUMO, two technical directors of the SUMO Group were also appointed to the Drafting Panel. The Steering Group by ICE and BSi was to assist with the writing of the PAS. The resulting specification has been written for practitioners to adhere to, with clients specifying the quality level of survey they require. As well as if detection is involved, determining the intensity with which it is carried out. The key element of the PAS is the hierarchal approach to the production of utility surveys. There are four quality levels which the client can specify - A through to D. A survey area may be subdivided so that the appropriate survey level is applied to each area. This completes the project need and addresses the safety and financial risk. The following table shows the scope of each type of survey and an appreciation of the cost benefit. * A minimum of the two techniques of electro-magnetic location and ground probing radar is required for a PAS 128 compliant survey. The client specifies the methodology and intensity of the detection survey. ** The verification survey specifies recording information available from manholes and intrusive excavation. Who is going to use the PAS? Those involved in design, such as consulting engineers should use it. The quality of the data obtained from utility surveys should be higher and more consistent. The comparison of quotes should also be easier. All compliant quotes should be based on a similar methodology. The introduction of the verification element of the specification allows clients to investigate, in detail, points of potential conflict. For example, where proposed new works may impact on the existing infrastructure. Those who need to have good accurate data for records of new works, facilities management, statutory records etc., would also be potential users of PAS 128. Finally, the other main users should be those trying to avoid utility strikes. This last category include those who are digging holes in the ground. Those who are daily faced with minute by minute uncertainties on whether the next draw of the digger bucket, or saw cut, will slice through a cable. This takes out the electric supply to the area and could seriously injure a member of staff. So, will PAS 128 help them? The risk potential of a strike is much higher from very near surface utilities buried within the blacktop. This is often in concrete surround. The unenviable task of the ganger who has to make informed decisions based on a bundle of record drawings from 8 or 9 different utility companies. Each with their own scale, key and format - and it is probably raining! Interestingly, the CECA reports do not mention ground probing radar (GPR), where including a high frequency GPR scan along the route corridor of a proposed trench. Together with the normal EML technique would help overcome the problem mentioned in 1 above. 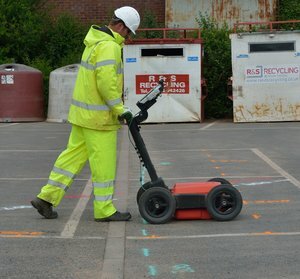 Remember also that PAS 128 requires GPR to be part of a survey as standard. The output of a PAS 128 survey will include a CAD plot of the results of all the utilities within the survey area. These can then be used to print a combined plot of all the services. Each colour coded with depths and quality levels shown. At SUMO, these plots can be large scale. This makes them easier to read and when laminated are waterproof. We can also train the ganger in understanding a PAS 128 compliant drawing. SUMO have long campaigned with industry stakeholders for a specification that will uphold standards in utility surveying and with 2 years in the making. PAS 128 will hopefully do this... but only if it is embraced by you, the customer. It is vitally important that you understand its content, purpose and the potential implications (financial and otherwise) of specifying its use. This ensures you are to get the most out of a PAS 128 compliant utility survey. SUMO is delighted to have been closely involved in the production of PAS 128 and will be pleased to explain its content to you further. SUMO will also be happy to provide a PAS 128 compliant survey to your individual specification. Contact us now, for more information. PAS 128 – 3 years on, is anyone any the wiser? Hailed as a means for customers to understand what they are actually ordering and compare like-for-like utility survey quotes fairly, it is now 3 years since PAS 128 was published.